Switching my calendar over from February to March is one of my favorite times of the year. It could be because we have 4 birthdays to celebrate within 4 weeks…so basically all I eat the month of March is cake, and by April all I feel like eating is kale and carrot sticks. Or not. I want to get crackin’ on some new quilts and designs but before I do that, I’ve vowed to finish up some oldies hanging in my closet. First up was this Summer Lucky quilt. I spray basted this one and free motion quilted it with my Juki. The Juki quilts like a dreamboat. I did a comparison a year ago between my Bernina 440 and the Juki…and even though the Bernina has the stitch regulator for quilting, I’d choose to quilt on the Juki any day. I machine bound it (tutorial here) with my go-to coral/pink Rose Bella Solid. I just stuck this one in the washer….it’s going to be so beautiful crinkly and soft! This quilt uses my Lucky pattern, but instead of using an all white background I cut the background from lots of low volume fabrics. Very beautiful quilt, you did a great job. Beautiful! Do you pre-wash all of the fabrics before putting your quilts together? I’ve never made a full bed-sized quilt and I’m trying to figure out logistics before I get involved with a big project. Hi Alyssa! Usually I don’t prewash any of the fabrics unless it’s a dark solid red or navy blue/black. I will pre-wash if I’m not sure where it came from or I don’t think it’s high quality, but not very often. If you’re worried about final shrinkage you can pre-wash your fabrics, backing, and even soak your batting…but I’d rather just make the quilt a tad bigger and account for shrinkage! Really nice looking quilt. I love the color pops. Mmmmm…cake! Enjoy all the March birthdays. Cake is good. Your quilt is adorable! Your March sounds like our February…and January…and December. By the time March is here I am ready to give up sugar for good! Love the quilt. Such beautiful colours! And the simple design is very calming! 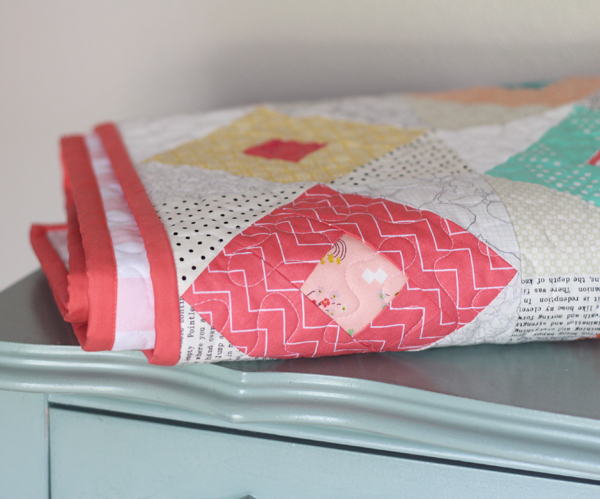 I love everything about this quilt!! The fabrics you chose and the way they pop against the light background- beautiful! I think it adds more interest with the different background fabrics instead of an all around solid fabric- very nice!! Oh, that came out beautiful! Happy colors! I love the subtle not-quite-whites in the background. And what happy colors! I’m in the northeast and need some happy colors this time of year! Love the quilt! I free-motion quilt on my Bernina 550 and don’t find the stitch regulator to be all that helpful. I used Warm and White batting…I buy a big queen size roll from Joanns when they are 50% off and have free shipping and it usually lasts me a year or more! Such a pretty finish! Your quilts rock! This is so lovely, I have yet to try quilting a big quilt you have done so well. I have been following you on instagram. Really like this quilt. 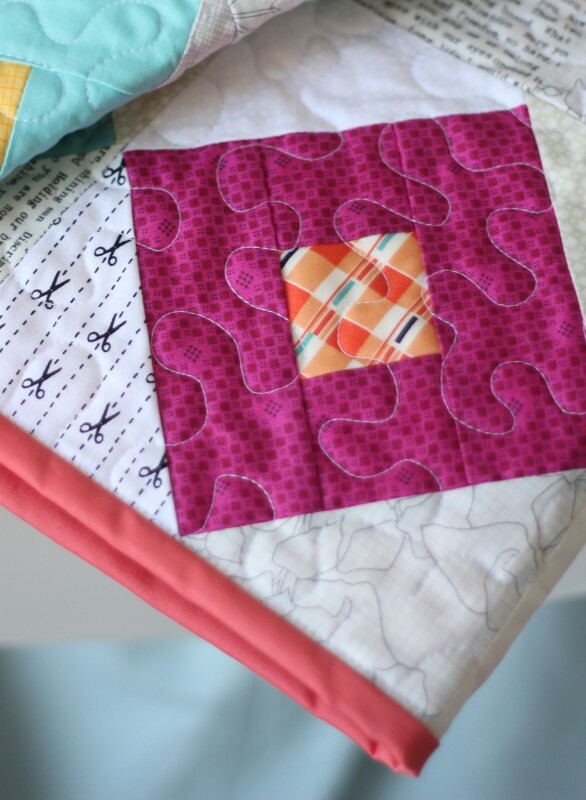 I have some small squares similar to these made from my scrap box – was planning on simply putting them all together, but it so happens that I have a low volume leftover stash needing using up too – Kismet! Thank you – your work is always inspirational (and your book “Growing Up Modern” is my go-to book for kids quilts). Thank you Pam! And yes this is a great way to use up those blocks…or set on the on point! Great quilt, Allison, I love it. My dad passed away :( …who your grandpa knows, you might let him know, or maybe he would have read it in the paper—Merrill Evans. Oh I’m so sorry I hadn’t heard! I hope all was well and peaceful…and that you are doing OK. Sending you my thoughts and prayers! It’s a beautiful quilt! It reminds me of another pattern of yours. Love your bright colors!! Congrats on your birthdays. I wish them fun! Thanks Judy! It is a very packed month of birthdays but it’s also nice to get them all done and it sure is fun! Oooh good idea Christine…I think I should do that too. ;) Happy quilting!!! Wonderful quilt and colors! Love the soft background too. What a happy, pretty quilt. I love this quilt! Summer Lucky fits the quilt perfectly, it looks like summer. Love the colors and fabrics you used. what a beautiful quilt. Love your fabric choices. So behind on my blog reading and so happy to see this post. The quilt is lovely! Your fabric collections are amazing too, Hope all is well with you. I’ll eat a cream stick for you…actually I don’t like them. But I always think of you when I see them! 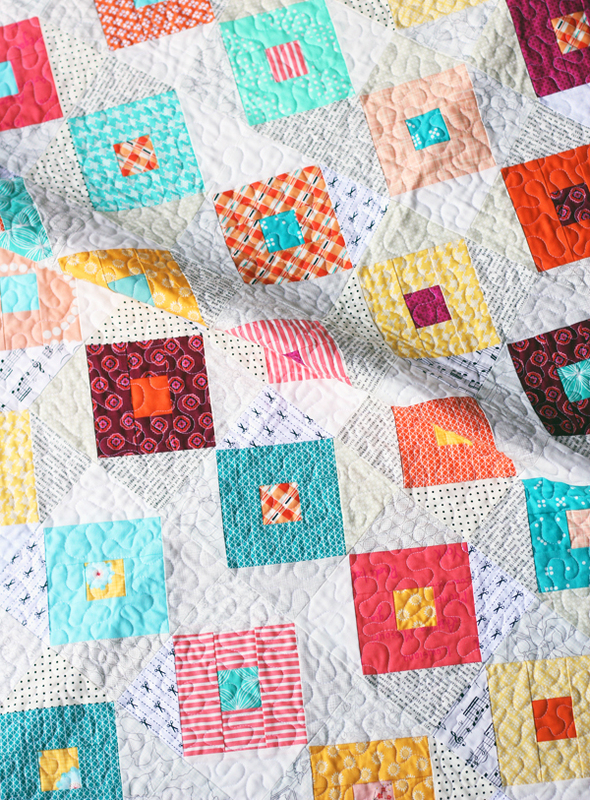 This quilt looks so great and so crisp and summery Allison! It’s perfectly named! I really love the interesting background texture you achieved with the low volume fabrics! We’re getting ready for our March birthday / surprise engagement party this weekend (my daughter) Hope you have a wonderful March full of happy celebrations! If I weren’t already, I’d marry this quilt. It is absolutely stunning! I absolutely love your quilt! It is so inviting and fresh. The quilting makes it cuddly. 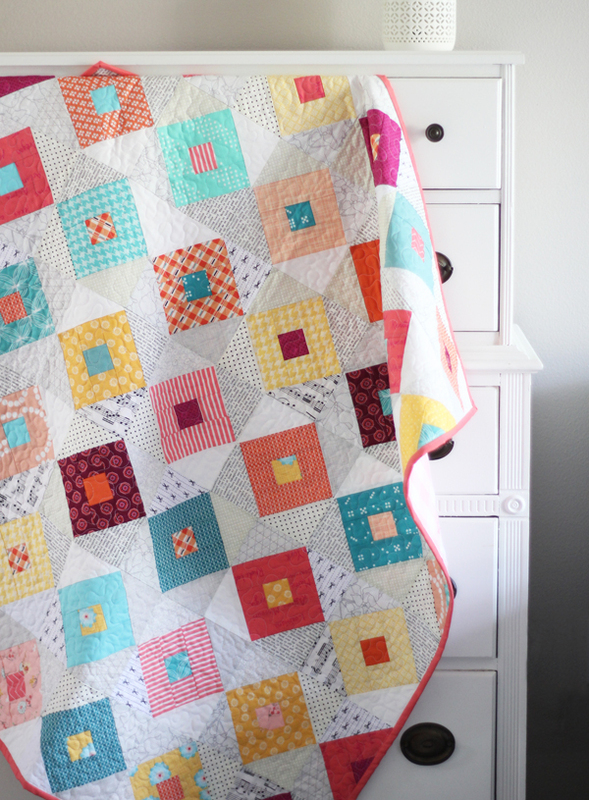 Love the fabrics you used in this quilt. Are these from your fabric line? It doesn’t shrink too much, but if you’re worried about shrinkage I would definitely soak it before hand, then dry it on low normally in the dryer. Also the Juki you asked about is the 2010Q.